Economically priced solar light adds colored elegance to any patio or water feature. Weather- and temperature-resistant plastic is watertight and buoyant with two bright internal LED lights. Hidden, push-button "ON/OFF" switch on base of sphere. Versatile design can also be suspended beneath a stand or attached to a garden stake (stand and stake not included). 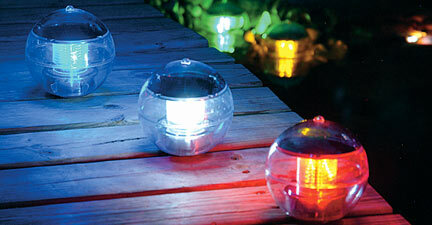 Multi-color Solar Light available in 6" diameter sphere. Automatically changes color for enchanting nighttime light effects. Multicolor feature transitions from red, yellow, green, and blue light for enhanced lighting effects.